What could you create if nothing were impossible? What can be achieved when passion, curiosity and analytics come together? 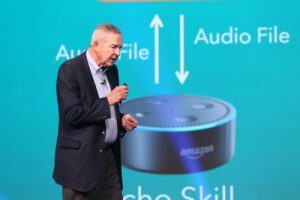 At Opening Session, SAS CEO Jim Goodnight and Alexa have a chat using the Amazon Echo and SAS Visual Analytics. Unable to attend SAS Global Forum 2017 happening now in Orlando? We’ve got you covered! You can view live stream video from the conference, and check back here for important news from the conference, starting with the highlights from last night’s Opening Session. It’s SAS’ mission to bring analytics everywhere and to make it ambient. That was exactly the motivation that drove SAS nearly four years ago when embarking on a massive undertaking known as SAS® Viya™. But SAS Viya – announced last year in Las Vegas – is more than just a fast, powerful, modernized analytics platform. Goodnight said it’s really the perfect marriage of science and art. Executive Vice President and Chief Marketing Officer Randy Guard took the stage to update attendees on new releases available on SAS Viya and why SAS is so excited about it. And he explained the reason for SAS Viya comes from the changes being driven in the analytics marketplace. It’s what Guard referred to as an analytics economy – where the maturity of algorithms and techniques progress rapidly. “This is a place where disruption is normal, a place where you want to be the disruptor; you want to be the innovator,” said Guard. That’s exactly what you can achieve with SAS Viya. As if SAS Viya didn’t leave enough of an impression, Guard took it one step further by inviting Goodnight back on stage to give users a preview into the newest innovation SAS has been cooking up. Using the Amazon Echo Dot – better known as Alexa – Goodnight put cognitive computing into action as he called up annual sales, forecasts and customer satisfaction reports in SAS® Visual Analytics. Though still in its infant stages of development, the demo was just another reminder that when it comes to analytics, SAS never stops thinking of the next great thing. On his Segway, Executive Vice President and Chief Technology Officer Oliver Schabenberger talks AI at the SAS Global Forum Opening Session. 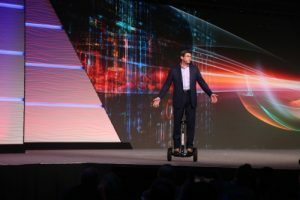 With his Segway Mini, Executive Vice President and Chief Technology Officer Oliver Schabenberger rolled on stage, fully trusting that his “smart legs” wouldn’t drive him off and into the audience. “I’ve accepted that algorithms and software have intelligence; I’ve accepted that they make decisions for us, but we still have choices,” said Schabenberger. Diving into artificial intelligence, he explained that today’s algorithms operate with super-human abilities – they are reliable, repeatable and work around the clock without fatigue – yet they don’t behave like humans. And while the “AI” label is becoming trendy, true systems deserving of the AI title have two distinct things in common: they belong to the class of weak AI systems and they tend to be based on deep learning. So, why are those distinctions important? Schabenberger explained that a weak AI system is trained to do one task only – the system driving an autonomous vehicle cannot operate the lighting in your home. “SAS is very much engaged in weak AI, building cognitive systems into our software,” he said. “We are embedding learning and gamification into solutions and you can apply deep learning to text, images and time series.” Those cognitive systems are built into SAS Viya. And while they are powerful and great when they work, Schabenberger begged the question of whether or not they are truly intelligent. Think about it. True intelligence requires some form of creativity, innovation and independent problem solving. The reality is, that today’s algorithms and software, no matter how smart, are being used as decision support systems to augment our own capabilities and make us better. With a room full of analytics leaders, Vice President of Sales Emily Baranello asked attendees to consider where the future leaders of analytics will come from. If you ask SAS, talent will be pulled from universities globally that have partnered with SAS to create 200 types of programs that teach today’s students how to work in SAS software. The commitment level to train up future leaders is evident and can be seen in SAS certifications, joint certificate programs and SAS’ track toward nearly 1 million downloads of SAS® Analytics U. More than just analytics and technology, SAS’ brand is a representation of people who make the world a better place. Knowing that, SAS announced the development of GatherIQ – a customized crowdsourcing app that will begin with two International Organization for Migration (IMO) projects. One project will specifically focus on global migration, using data to keep migrants safe as they search for a better life. With GatherIQ, changing the world might be as easy as opening an app. There's much more to come, so stay tuned to SAS blogs this week for the latest updates from SAS Global Forum! SAS Viya, AI star at SAS Global Forum Opening Session was published on SAS Users. What’s your big data problem? What’s your big data problem? was published on SAS Voices. What’s your digital health care plan? What’s your digital health care plan? was published on SAS Voices. An analytics revolution underway: Insights from Analytics Experience 2016 was published on SAS Voices. Sleep: Your legal performance enhancer was published on SAS Voices. Editor's Note: There are hundreds of breakout sessions happening at SAS Global Forum in both the Users and Executive programs. Since we couldn’t just pick one to highlight, we decided to put together a SAS Global Forum day 2 session roundup, highlighting some of our very favorites! There’s a constant buzz in the market around analytics and its role in the cybersecurity space, but often the conversation overlooks the important role data management plays. Data management is a fundamental component SAS cyber experts want to be sure organizations understand – just because the investment is being made in cyber analytics doesn’t mean companies can ignore data quality and data management. “There are countless solutions and dollars spent to protect organizations,” said SAS’ Director of Cybersecurity Christopher Smith. “All of those pieces – firewalls, endpoints and email gateways – play a vital role, but those systems don’t communicate with each other.” Even with all the investment organizations are making to protect themselves, there is still no greater insight being gained into what’s actually happening inside company walls. What’s needed is business context, and that’s something isolated solutions cannot provide. While those systems are valuable in identifying what’s good, what’s bad and what can be defined, they offer limited business intelligence. But the challenge isn’t just about obtaining data, it’s about the speed, type, structure and volume of data being generated per second. Levy said that’s where data management becomes critical. Companies have to enlist the proper data management techniques to avoid lagging in security and exposing themselves to added risk with every attack. By looking at what’s actually happening, companies can see what the data is saying and then develop an effective response. The fear today is not what happened, it’s the unknown of what else has happened that we haven’t yet identified. “Once data is created it will always be an asset to the business,” said Smith, which means it must be catalogued to offer value. Effective cyber protection requires sophisticated analytic prowess with rich data history in order to protect organizations from the clever and skilled hackers. In his April 20 Executive Conference breakout session, Sterling Price, Director of Customer Analytics at WalMart Stores, Inc., cautioned against relying too heavily on completed analytical projects, assuming that new technologies and massive data sets produce an accurate and relevant result. He used several historical examples, from the Google Flu prediction mishap to the faulty prediction outcome of the 1936 US presidential race, to help prove the point. Big data, it turns out, is simply the newest phenomenon tempting leaders to believe their outcomes are statistically sound. "We owe our organizations objective analysis based on science, not wishful thinking," said Price. Don't fall prey to the belief that results will be accurate and useful because of how much data was used. We still need to sample things, but a badly chosen large sample - even a really big one - is much worse than a well-chosen small sample. Methodology still matters. Big data by itself does nothing. How we use it defines its value. Scalability should be considered up front. Don't mistake statistical significance for practical significance. They are not the same. Analyzing "stop and frisk" data captured by the New York City Police Department can lead to insights that help cops make better decisions about whether to arrest a person or not, say two Oklahoma State University graduate students. Karan Rudra and Maitreya Kadiyala looked at open source data from the NYPD to understand the propensity of arrest and optimize frisk activities. This type of analysis can potentially reduce the number of stops and impact the arrest rate. The pair examined 56 variables, including in which precinct a stop occurred, whether a stop led to an arrest, whether the officer produced an ID and shield, and whether a person was stopped inside or outside of a building. In the Bronx and Manhattan, females have the highest percentage of arrests after a stop and frisk. In Staten Island, though there are a high number of stops per area, the number of resulting arrests is comparatively low. Blacks and Hispanics have a higher percentage of arrests after a stop. The overall arrest rate of the data sample was 6 percent. Highlights from SAS Global Forum: Cybersecurity, analytic failure and getting arrested was published on SAS Users.